ISC West, Las Vegas USA – April 6th 2016 –The International Security Conference & Exposition – also known as ISC West – is the largest event in the U.S. for the physical security industry, covering Access Control, Alarms & Monitoring, Biometrics, IP Security, Video Surveillance / CCTV, Networked Security Products and more. TextSpeak exhibited the full range of earBridge™ products for the first time to the security industry and came away with top honors at the show. At ISC West, TextSpeak introduced TTS-CE-US, the industry’s first cellular enabled text to speech amplifier. This new addition to the earBridge™ family transfers SMS emergency cellular text messages directly to endpoint speakers and paging systems. Simply send an SMS message to the pre-assigned telephone number and the earBridge amplifier speaks the text. 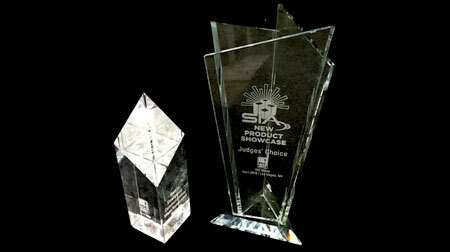 Each year at ISC West, the Security Industry Association (SIA) New Product Showcase program recognizes winners in several product and service categories. 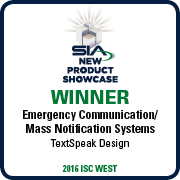 TextSpeak’s new TTS-CE-US Cellular Amplifier won the ‘Best New Product in the Emergency Communication/Mass Notification Systems’ category, and the ‘Judges Choice Award’, only awarded to a single product out of all the entries. TextSpeak is the world’s leading provider of multi-language embedded Text to Speech products. 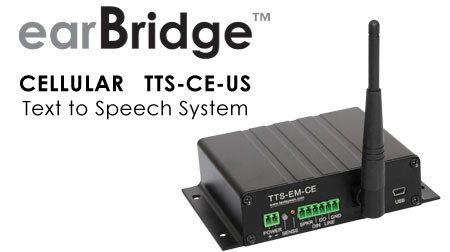 Based in Westport Connecticut, TextSpeak designs and produces human sounding embedded text to speech (TTS) ADA compliant voice solutions for transportation systems, banking, industrial, security, educational campuses, healthcare facilities and mass emergency notification systems. Founded in 1992 TextSpeak solutions are currently deployed in thousands of locations worldwide including the Paris and New York City Transit Systems, Ford Motor Proving Grounds and the NSA Lawrence Livermore Labs. TextSpeak also manufactures low cost Talking Keyboards to aid members in the disability community.